William has been involved in the Martial Arts for many years. Starting in Tae Kwon Do as a young boy, he excelled through the ranks in a very short time, winning numerous tournaments in his class. In 1978, he was introduced to Traditional Japanese Karate, taught by Sensei Akira Sato and began his training in Shito Ryu Karate-do. In 1989, William received his Shodan (1st Degree Black Belt) in Karate from the late Grand Master of Itosukai Shito Ryu Karate, Ryusho Sakagami. William has been an active competitor in the Martial Arts throughout North America and different parts of the world. He brings with him many years of competitive experience in the field of Sport Karate. William is one of the most sought after instructors for traditional Karate in Canada and parts of the United States, due to his experience as a competitor. William's introduction into Kobudo (weapons training) was through Suzuki Seiko Soke, a Japanese student to the late Taira Shinken and Sakagami Ryusho. William was introduced to Ryukyu Kobudo by Tamayose Hidemi, the Kaicho for Ryukyu Kobudo Tesshinkan. 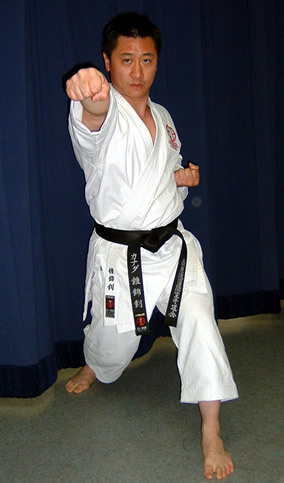 In 2011, William became a student to the famous Okinawa master, Akamine Hiroshi, the Kaicho for Ryukyu Kobudo Shimbukan. He currently teaches Ryukyu Kobudo Shimbukan in Vancouver with a core number of dedicated students. William was also the Canadian National Weapons Champion for the years 2000 and 2001. Apart from being on the Canadian National Karate Team, William was also part of the 1986 Canadian National Wushu (Kung Fu) Team which competed in Tianjin, China; taking 5th place overall. William was rated as one of the top performers for the years 1985 to1987 by, "Karate Illustrated Magazine". In 2001, William was awarded the "Most Inspirational Athlete" by Karate BC. Then in 2004, William wanted to learn more about traditional orthodox Shito Ryu Karate-do and joined the, Seito Shito Ryu International Karate-do Kai under the tutelage of, Master Kenzo Mabuni, the son of Shito Ryu Karate-do founder, Kenwa Mabuni. William was awarded his Shihan Menjo (Master's Certificate) by the Japanese Executive Council for the Seito Shito Ryu Karate-do Kai in Osaka, Japan.